SINGAPORE (Dec 11): The rainy Monday morning does not dampen Loretta Chen’s energy as she paces about the snug dessert cafe Janice Wong Singapore, sizing up the place and suggesting various spots for our photoshoot. At one point, the former theatre director remarks how grateful she is to be up and walking again. In 2015, Chen had ripped both knees in a surfing accident in Hawaii, where she currently lives with her husband. The episode left her unable to walk without assistance until August this year. But it also enabled her to focus on her latest book, which she had been working on since late 2014. 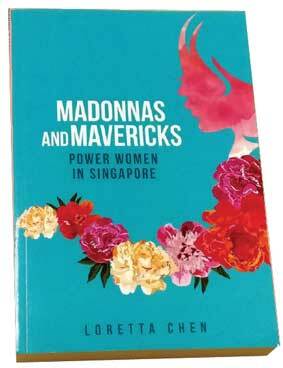 Despite living in the US, Chen is back on the local writing scene with Madonnas and Mavericks: Power Women in Singapore. Close to 400 pages long, the book presents interviews with 17 prominent women in Singapore, including then-Speaker of Parliament Halimah Yacob, national athlete Theresa Goh, dessert chef Janice Wong (hence the choice of location) and Chen’s own sister-in-law, TV darling Xiang Yun. The book adopts a question-and-answer format, with the majority of the talking done by the interviewees. This is Chen’s third book to date. In 2014, she made her writing debut with the autobiography Woman on Top, which delved into her family life, struggles with a partner’s suicide and a business failure. Chen has since taken on women issues and leadership as her “personal beat”. In September last year, she published The Elim Chew Story: Driven by Purpose, Destined for Change, a biography of the ­female entrepreneur behind the streetwear retail chain 77th Street. The book serves as a prelude of sorts to the bumper crop of interviews in Madonnas. Chen speaks effusively of her decision to write about prominent women in Singapore. As an arts figure and the younger sister of former actor Edmund Chen, she has experienced the perks and pitfalls of fame. And as a woman herself, she feels empathy for the stories her interviewees share. “I know what it’s like to live in a woman’s body; to think, feel and breathe like a woman. I think I’m better able to understand the nuances of being a woman, the challenges and stereotypes we face and also the glass ceilings we may need to break. I understand those a lot more holistically and intrinsically as a woman,” she says. The motley group of women featured in the book was a direct result of wanting to present diversity in age, race, sexuality and field of expertise, among other markers, Chen says. She defines a Madonna as someone who has perfected her craft, and is “pristine, virtuous and focused”. Meanwhile, a maverick is adaptable and unafraid of flouting norms. But in reality, each woman featured defies categorisation, she adds. In fact, Chen had initially conceptualised her book quite differently. She had intended to fit each woman into one of three categories: Madonnas, mavericks or matriarchs. In addition to the first two labels, a “matriarch” was meant to be someone who was a pioneer in her field. But her interview with ambassador-at-large Chan Heng Chee changed that, with the veteran diplomat questioning the wisdom of selecting just one label. In contrast to her initial approach, Chen began to wrap her interviews with an open-ended trivia question: Do you see yourself as a Madonna, maverick or any other “M” role? This drew a variety of interesting responses, from “mobiliser” to “mummy” and even one that did not begin with the letter “M”. That in itself is testament to how “uncategorisable” the women are, Chen says. Perhaps the most prominent of her interviewees is President Halimah, who at the time of interview was still the Speaker of Parliament. Interestingly, Halimah was one of the easiest interviewees for Chen to gain access to, which she describes as a “pleasant surprise”. It was a similar situation with Workers’ Party chairman ­Sylvia Lim, whom she describes as “candid and approachable”. In each interview, highlighting the personal struggles and dark moments was a priority, Chen says. For instance, her interview with Odile Benjamin, the brains behind fashion label Raoul, kicked off with the heavy topic of her years as a refugee out of Lebanon. The interview later progressed to Benjamin’s struggle with breast cancer, the intimate details of which she shared openly. Chen was in tears early into the interview itself. Similarly, Chen asked violinist Siow Lee-Chin about coping with the loss of her father, and being diagnosed with cancer. With Nichol Ng, the managing director of F&B distributor FoodXervices, she broached Ng’s struggle with bulimia. And she got paralympian Goh to talk about her first “crushing defeat” at the Beijing Games. The theme of “power failure” stems from her own life experiences, Chen says. In Woman on Top, she recounted some difficult experiences in her life. In her mid-20s, the suicide of a partner led her to try to take her own life, before she finally checked herself into a mental health facility. And in 2010, she publicly resigned from Zebra Crossing Productions, the theatre company she co-founded, which was $1 million in debt. But Chen reckons that she has approached failure head-on, to build on her personal brand of “a phoenix rising from the ashes”. She points out that, coincidentally, part of her name in Mandarin translates to “phoenix”. Chen has since reinvented herself. Following several stints in Bhutan from 2012 to 2016, she began to desire a simpler life, living close to nature. Her love of the ocean prompted her to consider Hawaii, which she visited frequently around the same period. In early 2015, she met her husband in Hawaii via match.com, a move which she candidly compares to “shopping online” for a partner. Last year, she moved to the US under the extraordinary ability visa programme. But with all the perks of living abroad, Chen says that her heart remains connected to Singapore. “Writing is such a wonderful way I’ve found to keep that connection,” she says. Chen will be working on another installation of interviews with Singapore’s power women in 2019 or 2020. But in the near term, she is focused on a book on inspiring women in Hawaii itself, which will probably be out in the fourth quarter of 2018. While the title has not been confirmed, she expects it to have the phrase “Mana Wahine”, which translates to “power women”. With its collection of 17 interviews, Madonnas and Mavericks: Power Women in Singapore makes for relatively easy reading. Each chapter, featuring one woman, kicks off with a preamble written by author Loretta Chen that lays out the circumstances of their meeting, and her initial impressions. Chen’s eye for detail comes through in her frank, light-hearted assessments of her interviewees. In ambassador-at-large Chan Heng Chee, for instance, she sees a demeanour that is “practised and calculated, like a stealthy jaguar on the hunt”. Whereas in firebrand farmer Ivy Singh-Lim, she notices that “theatrical flamboyance” is very much accompanied by a strong love for Singapore, even as she criticises the establishment. And in introducing her former schoolmate, actress Janice Koh, Chen quips that there is “every reason for a girl to hate [Koh], except that she always makes sense”. These little snippets, peppered with astute observations and candid opinions, are entertaining and set the stage well for the subsequent interviews. The interviews are presented in a question-and-answer format, with Chen’s questions kept to a few lines, and the interviewees’ answers ranging from a few paragraphs to a few pages. In some interviews, the airtime for the featured women works well. In Singh-Lim’s chapter, for instance, her tirades are printed in all their comic irreverence, doing justice to the maverick that she is. As Chen points out, Singh-Lim is “all text and no subtext”, making a transcript of her thoughts an entertaining read. In some other cases, however, the transcripts can get heavy. The interview with President Halimah Yacob, for instance, is full of details on her long career with the labour movement. While a useful resource for anyone doing research on one of the featured women, some parts may be somewhat cumbersome for the casual reader. At such points, perhaps writing in the prose format might have improved the reading experience. Chen did in fact start off writing the book in prose, but stopped when she realised that she was imposing too much of her “dominant personality” on her interview subjects. “They were starting to sound like me, and I was sure that was not what I wanted,” Chen says in our interview. While the aim of preserving authenticity in the women’s voices is commendable, perhaps a better balance could have been struck between prose-writing and the Q&A format. Nevertheless, Chen’s work is notable for offering some insight into the lives of influential women that are not often represented in the mainstream media. For one, many of Singh-Lim’s colourful denouncements of the government printed in the book are unlikely to have made the cut elsewhere. Meanwhile, ambassador Chan’s take on sunset romances provides a refreshing take on a formidable public figure mostly known for her work as a veteran diplomat. Those who expect these prominent figures to be grilled may not be fully satisfied with Chen’s book. The interview with Hyflux’s Olivia Lum, for instance, does not touch on the business’ missteps in recent years. But for those seeking more personal anecdotes and life lessons from women who have made it to the top, Madonnas may very well be an uplifting read. This article appeared in Issue 809 (Dec 11) of The Edge Singapore.